Horace and Hattie find a new friend to play with as they hide and seek among the harbingers of fall. 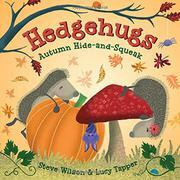 The first three spreads follow the pattern of the other books in the Hedgehugs series, establishing a few things the best friends like to do together and what they each do when the other is busy. In this title, Hattie is sad at the prospect of bare trees. Horace attempts to cheer her by grabbing a handful of fallen leaves and trying to stick them back on. In the process, he is startled by the squeak of a little bat hanging in the tree. Hattie and Horace go tumbling into a pile of leaves, and the bat takes this as the start of a game of hide-and-seek. The three play happily, taking turns hiding and seeking, and readers will enjoy spying the friends in the pictures. The last leaf falling from the tree signals that it’s time for the bat to go home, and Hattie is sad again. A whispered conference, though, allows Horace and the bat to give Hattie a wonderful surprise. Pink, yellow, brown, orange, gray, and maroon dominate Tapper’s fall palette, some blackberry bushes providing cover for the purple bat’s hiding spot.